A recent post by Forbes has estimated that, “by 2018, 62% of CRM will be Cloud-based, and the Cloud Computing Market will reach $127.5B. Enterprise spending on SaaS applications is approaching 30% of all application spending, and is currently growing at a 17.6% CAGR from 2013 to 2018.” The CRM scenario is changing and this changes the way enterprises need to look at implementation and acceptance of CRM within the ecosystem. Salesforce is one of the preferred CRMs, and Salesforce implementation is critical for enterprises to ensure that it syncs in seamlessly within the DNA of the system. Why is an Implementation Blueprint critical? The initial and important point to consider is to create an implementation blueprint. It can help in the longer run to ensure effective and seamless implementation. After the blueprint is sketched, teams would be in a better position to identify the organization’s goals, pain points, and success metrics. They would be able to map the business processes with Salesforce solutions and identify implementation project staffing, set timelines, and estimate the budget requirements. Practically, it helps to estimate the overall lifecycle for Salesforce implementation and ensures that every function is effectively mapped on the chart. Salesforce implementation needs to be mapped on various grounds, namely, standard functionality, custom functionality, and complex data modelling. It holds numerous implications for an organization and will determine the way it delivers and operates on the whole. A blueprint is a scrupulously designed plan that helps manage and streamline the process with all fundamental business objectives in place. Apart from creating a blueprint or a broad plan after considering the business objectives, it is important to consider some fundamental aspects. This will make Salesforce implementation a collaborative activity and also make everyone within the organizational ecosystem involved and responsive. The objectives have been defined, and now you need to plan to achieve the set objectives. The first and most important step is to communicate the benefits and highlights of the software to the respective teams. This will help to buy in their approval, which will enable seamless implementation of Salesforce within the system. This has to be a well-established effort to ensure that there are no hiccups while taking this process forward. If your team is not convinced with the implementation and is not clear about their role, it can definitely create issues and delay the process. It is important to gather diagnostic data to ensure the expected results from the tests. When the CRM, or in this case Salesforce, is implemented, it is important to check the needs, the issues, and the problems within the system that need to be solved with the implementation. These requirements need to be gathered and documented, which can be referred to at a later stage. The requirements can be evaluated on the basis of cost versus benefits model and accordingly prioritized. This can also involve test data. When you have sorted matters at the macro-organizational level, it is imperative to get to the core of the process. While testing the code, it is recommended to isolate the tests, which will ensure that they interact only with the data that is relevant for the tests. It is also necessary to confirm that your tests do not affect the data that might keep changing within the organization. It is a good practice to consider as it can be referred to as a constraint when someone else reads your tests. There are numerous tests that are conducted to ensure that the software is in sync with the organization’s IT and operational system. Hence, it’s a good practice to arrange what you might need for your tests, including test data for reference. This can be separately referred and documented. The next step is to apply these tests and finally check the results to confirm on the outcome. Every test has to confirm the expected outcome, otherwise it doesn’t count. 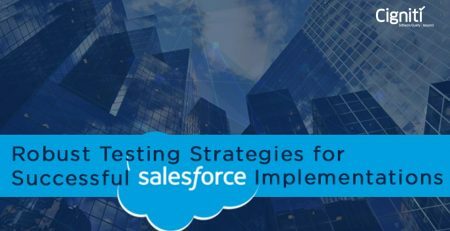 With Salesforce testing, tests are executed at the system level and has visibility into organization’s properties and configurations. Hence, it is recommended to run tests using some real user profiles too, which will help to ensure that the test is effective even with the assigned constraints on the profile. Repeated tests are needed to ensure that the results are consistent even with any kind of environment changes. Testing for Salesforce is critical, as it is imperative to ensure that no fluctuation of database impacts the outcome on a consistent basis. This kind of confirmation is difficult with manual testing, where there can be human errors or misses. Hence, automation of testing and using automation frameworks can be very effective. It is also important to execute these tests on a regular basis, which will further ensure the health of your enterprise applications and help fix issues way before deployment. Every new software implementation within an organization must bring relevance and business value. 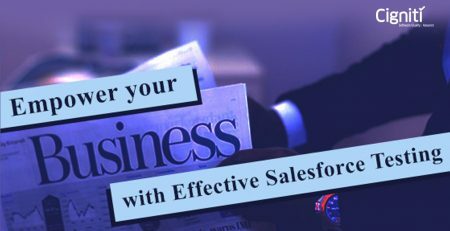 A lot has been spoken about the benefits of Salesforce and how it can enable various teams to bring value and higher RoI. However, effective implementation of the CRM can only bring seamless acceptance and generate consistent value. This can be done by setting independent teams or bringing in an independent implementation partner. It totally depends on the perspective and skill sets the organization has for effective implementation of Salesforce. Cigniti’s Salesforce Testing CoE team has built a repository of pre-built test accelerators including both manual test cases and automated test scripts, a well-defined test data management processes, and has a robust test automation framework for Salesforce. Cigniti’s pre-built test accelerator suite comprises 300+ manual test cases and automated test scripts that are customized based on client requirements. Connect with us and leverage Cigniti’s Salesforce testing expertise and build a proven test strategy to ensure lasting success for your Salesforce implementation.